LOS ANGELES- November 28th, 2018- Garth Brooks has sold out two out of two. 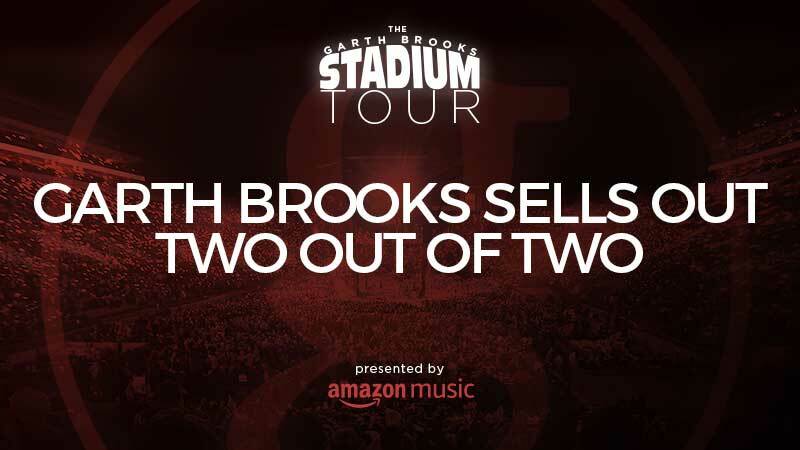 Only two shows have gone on sale so far on The Garth Brooks Stadium Tour but both are now sold out. The Dome at America's Center in St. Louis, MO, set for Saturday, March 9th at 7:00 PM, sold out first. Now State Farm Stadium in Glendale, AZ set for Saturday, March 23rd, 7:00 PM, has also sold out! Garth has two more stadiums on sale this week. On Thursday, University of Florida's Ben Hill Griffin Stadium in Gainesville, FL, goes on sale at 10:00 AM EST. The concert will be Saturday, April 20th, 7:00 PM. On Friday, Heinz Field in Pittsburgh, PA goes on sale at 10:00 AM EST. That concert will be Saturday, May 18th, 7:00 PM. For both shows, tickets can only be purchased at ticketmaster.com/garthbrooks or either Ticketmaster Express 1-866-448-7849 or 1-800-745-3000. The Garth Brooks Stadium Tour is presented by Amazon Music.